11 a.m., United Group Service, the Parish Eucharist (Holy Communion 2), Castletown Church, Kilcornan (Pallaskenry), Co Limerick. Readings: Micah 5: 2-5a; the Canticle Magnificat (Luke 1: 46-55; Hymn 712, CD 40); Hebrews 10: 5-10; Luke 1: 39-45. This has been a very short Advent. There are four Sundays in Advent, but this year had Advent had just three weeks. So, I got caught again – I was so late in sending Christmas cards that many are probably not going to arrive until well into the New Year. I kept on ignoring all the advertising from An Post claiming Christmas begins when the first card is sent. But that sounds as ridiculous as saying Easter begins with the first crème egg. Once again, too, we have all got caught in preparing for Christmas, so much so that many of us forgot about Advent as a time of waiting, a time of preparation, a time of anticipation. We have been busy preparing ourselves in December, busy with the cards and the carols, the songs and the shops, Santa and the decorations. But Advent is important in itself too. The Advent Wreath and the four candles in a ring around the white candle– three purple and one pink candle –remind us, week-after-week, of those who prepared us in the past for the Coming of the Christ Child: first the Patriarchs and Matriarchs, including Abraham and Sarah, Isaac and Jacob; then the prophets of the Old Testament; then it was Saint John the Baptist. Then, today, the fourth and final candle reminds us of the Virgin Mary as she anticipated and prepared for Christ. We are reminded of that with the Canticle Magnificat, normally appointed for Evening Prayer, and the Gospel reading, both telling us the story of Mary and her visit to her cousin Saint Elizabeth. The great German theologian and martyr, Dietrich Bonhoeffer (1906-1945), in an Advent sermon in London 85 years ago in 1933, said the canticle Magnificat ‘is the oldest Advent hymn.’ He spoke of how the Virgin Mary knows better than anyone else what it means to wait for Christ’s coming. When the Virgin Mary visits her cousin Saint Elizabeth, they are both pregnant – one with the Christ Child, the other with Saint John the Baptist. 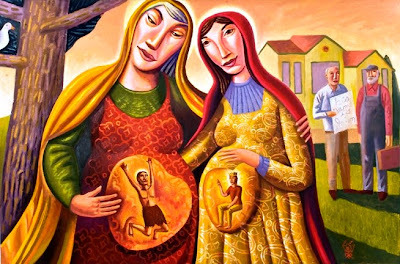 When she arrives, although he is still in his mother’s womb, Saint John the Baptist is aware of the presence of Christ and the unborn child leaps for joy. 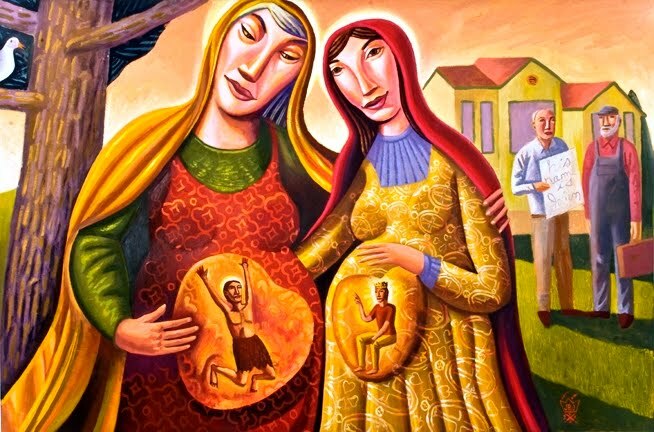 So we see, side-by-side, two women, one seemingly too old to have a child, but destined to bear the last prophet, linking the Old Testament and the New Testament; and the other, seemingly too young to have a child but about to give birth to a new beginning, a new age that is not going to pass away. 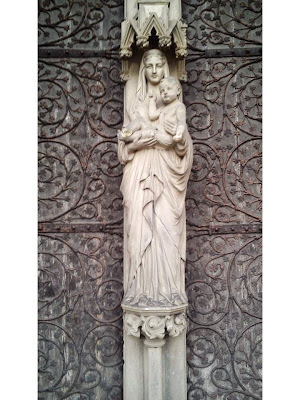 I find it sad that the Virgin Mary can be divisive for those in the Protestant and Catholic traditions, in the wider Church and within Anglicanism. There are numerous cathedrals and churches in the Church of Ireland and throughout the Anglican Communion dedicated to Saint Mary, including Saint Mary’s Cathedral, Limerick, and many Anglican cathedrals have Lady Chapels. Article 2 of the 39 Articles is a traditional Anglican affirmation of the Virgin Mary’s title as Theotokos, the God-bearer or Mother of God: ‘The … Godhead and Manhood, were joined together in one Person, never to be divided, whereof is one Christ, very God, and very Man …’ Any other interpretations quickly lead to the heresies of Arianism, Nestorianism or Monophysitism. 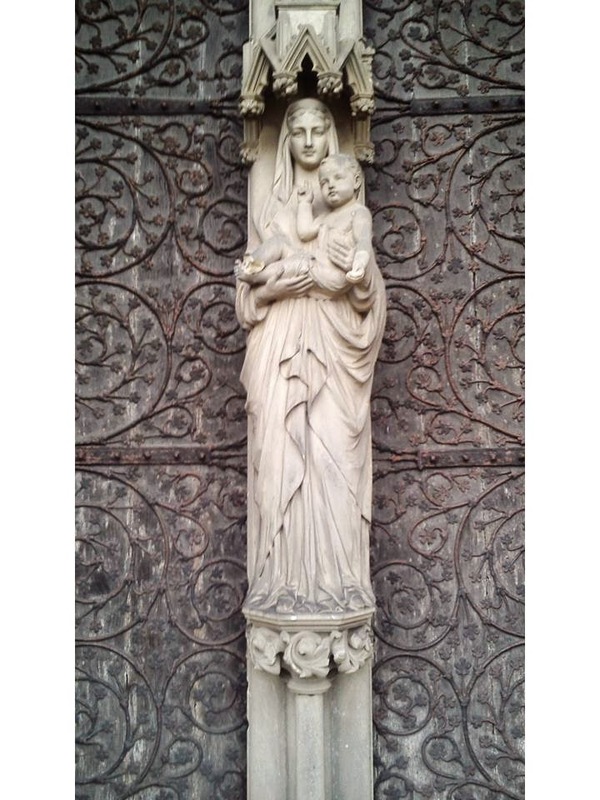 The divisions among Anglicans over the place of the Virgin Mary are probably founded on perceptions of Mariology within the Roman Catholic tradition. On the other hand, many of my neighbours who come out with statements that reflect what they have been told since childhood – such as ‘You don’t believe in Mary’ – are surprised when they are told the canticle Magnificat is a traditional part of Anglican Evensong ever since the Reformation. 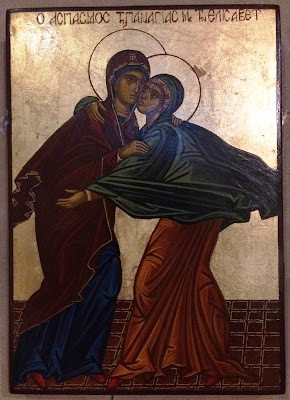 The Virgin Mary of the canticle Magnificat and of the Visitation is a strong and revolutionary woman, unlike the Virgin Mary of the plaster-cast statues and the Rosary. 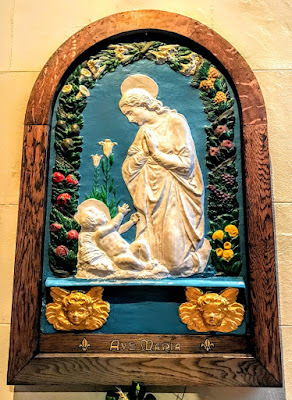 The Mary I see as a role model for belief and discipleship is the Mary who sets off in a hurry and a flurry to visit her cousin Elizabeth, the Mary with a gob on her who speaks out of turn when she comes out with those wonderful words we hear when she sings the Canticle Magnificat. What a contrasting pair these two cousins, Mary and Elizabeth, are! How much they speak to so many of the dilemmas we have in Irish society today! Elizabeth is the older woman. She has been married for years. Because of social and family pressures, she had started to become embarrassed that after all those years of marriage she has not become pregnant. In those days – even in many places to this day – this was an embarrassing social stigma. She had no son to inherit her husband’s lands, his family position, the place of Zechariah as a priest in the Temple in Jerusalem. She reminds us too of Sarah, who is so embarrassed at the thought of becoming pregnant in her old age that she laughs in the face of the three visitors, she laughs in the face of the living Triune God. Today, a woman who became pregnant at her stage of life might not laugh. She might quake with fear. She might ask for amniocentesis or an amniotic fluid test. And yet Elizabeth takes control of her situation. She turns a predicament into an opportunity, a crisis of a pregnancy so late in life into a blessing for us all. 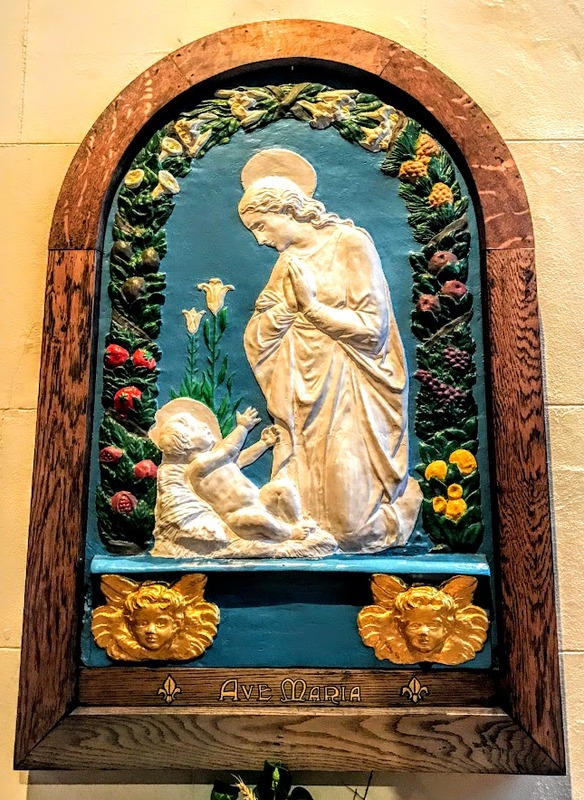 She is so filled with joy when her cousin Mary arrives that as soon as she hears the knock on the door, as soon as she hears the sound of Mary on her doorstep, her joy is infectious, so infectious that even the child in her womb leaps with joy in her womb. Elizabeth’s action is radical. Life is tough enough for her. Her husband has been struck dumb. A dumb priest was unlikely to be able to continue to earn a liturgical living in the Temple in Jerusalem. How was she now going to provide for her child when he was born? But Elizabeth’s action is even more radical than that. How many women of her age, and her respectable background, would have been so quick to rush out and welcome her much younger, single and pregnant cousin? How many women might have suggested instead that Mary goes off and finds a home where they can find someone else to take care of her child when he is born? Mary for her part is such a wonderful, feisty person. She is, what might be described in the red-top tabloids today as ‘a gymslip Mum.’ But, instead of hiding herself away from her family, from her cousins, from the woman in her family who is married to a priest, she rushes off to her immediately, to share her good news with her. And she challenges so many of our prejudices, and our values, and our presumptions today. Not just about gymslip mums and unexpected or unplanned pregnancies, but about what the silent and the marginalised have to say about our values in society today. It is almost like this is the programme or the agenda we can expect when the Christ Child comes among us on Christmas Day. This is the Fourth Sunday in Advent, and we have almost reached the end of the Advent season this year. Later this morning [23 December 2018], there is only one service in this group of parishes, and I am presiding and preaching at the Parish Eucharist (Holy Communion 2) at 11 a.m. in Castletown Church, Kilcornan, Co Limerick. ‘Anglicanism in Malaya (now Malaysia) began with the arrival of the British India Company in 1786. Construction of the first Anglican church, Saint George the Martyr in Penang – was completed in 1818 – and the first service was held on Christmas Day. At first, church services were mainly attended by prominent British families and army personnel. However, SPG [now USPG] and other Christian organisations took an interest in spreading the gospel and the church opened its doors to the community, so that Anglicans became a living denomination. ‘The early pioneers did not know what would come of the seed they had planted. But now see how that seed of faith has grown and spread so that today we have a thriving Anglican presence not only in Malaysia, but throughout East Asia and South East Asia. So we pray for Christians the world over. May we be renewed in faith, hope and love. Today’s suggested reading is Luke 1: 39-45, which is familiar as the canticle Magnificat, recommended in the Revised Common Lectionary as a canticle today [23 December 2018, Advent IV] and as part of the longer version of the Gospel reading. Pray to become a messenger of hope, give thanks for all who encourage us and help us live life fully. Micah 5: 2-5a; the Canticle Magnificat or Psalm 80: 1-8; Hebrews 10: 5-10; Luke 1: 39-45 (46-56).